- Publisher In this Radio Theatre audio drama adaptation of George MacDonald's classic story, a beautiful woman known as the North Wind blows through a small village in Victorian London, and everyday lives are mysteriously enveloped by a power and a glory. Along the way, she visits a poor stable boy named Diamond and takes him with her on her journeys. "At the Back of the North Wind" explores the place of death in our lives, social injustice, and our deep need for love and forgiveness. ^C. S. Lewis, author of the classic Chronicles of Narnia series, said of MacDonald, "What he does best is fantasy--fantasy that hovers between the allegorical and the mythopoeic. And this, in my opinion, he does better than any man. MacDonald is the greatest genius of this kind whom I know." 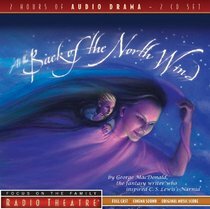 About "Radio Theatre: At the Back of the North Wind (2 Cds)"
In this Radio Theatre audio drama adaptation of George MacDonald's classic story, a beautiful woman known as the North Wind blows through a small village in Victorian London, and everyday lives are mysteriously enveloped by a power and a glory. Along the way, she visits a poor stable boy named Diamond and takes him with her on her journeys. "At the Back of the North Wind" explores the place of death in our lives, social injustice, and our deep need for love and forgiveness. ^C. S. Lewis, author of the classic Chronicles of Narnia series, said of MacDonald, "What he does best is fantasy--fantasy that hovers between the allegorical and the mythopoeic. And this, in my opinion, he does better than any man. MacDonald is the greatest genius of this kind whom I know." George MacDonald (1824-1905), Scottish poet, preacher, and novelist was one of the most original and influential writers of Victorian Britain. He wrote over 50 books with millions of copies sold, and he was one of the most popular authors of the day on both sides of the Atlantic. Drawn to the pulpit early, MacDonald eventually left to pursue his writing. Numbered among Dickens, Trollope, and other giants of the age as a novelist, MacDonald ended his career with over 50 books ranging from fantastical literature, to children's stories, to critical essays, and numerous novels. In addition to writing, MacDonald lectured extensively. MacDonald's fiction combined the man's immense spiritual understanding with his innate storytelling ability. His works have influenced writers like C.S. Lewis, J.R.R. Tolkien, and many others.- Publisher.